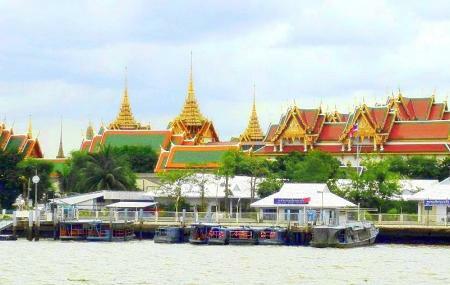 Find hotel near Wat Phra Kaew & The Grand .. The Grand Palace and the Wat Phra Kaew together makes an architectural digest for which people from all over the world gather in Bangkok, no matter how much crowded it becomes or how strict the authority gets regarding the street dress code for the Wat Phra Kaew or Temple of the Emerald Buddha. The massive statue of Buddha is carved from a single Jade block. The walls of the Grand Palace are adorned with intricate murals depicting the scenes from the Ramayana. The architecture of the place is a perfect fusion between Northern and Southern Thai and North-Eastern Khmer. The palace was the residence of the royal family of King Rama and now acts as a venue to offices of dignitaries and holding royal ceremonies. How popular is Wat Phra Kaew & The Grand Palace? People normally club together Grand Palace and Wat Pho Reclining Buddha while planning their visit to Wat Phra Kaew & The Grand Palace. The grandeur of the palace is visible even in the photographs, but the place is really imposing and alluring at the same time in real life. This is one place where I wish we were able to spend more time (was a bit hurried because of crowd and my irate 6 yr old, who was tired because of the heat). Best visited early morning when there will be less crowd and weather would be more pleasant. You have to dress appropriately and best to wear comfy footwear that can be removed easily. In addition to the buildings that housed the royal family and their administrative halls, the most important Emerald Buddha (really beautiful idol) temple is also situated in this complex. Probably the most beautiful Palace in the world. I absolutely love to visit here. If you can arrive and get in the queue at 8am, you stand a good chance at being able to visit the Palace ahead of the crowds. For me, the highlight is the Emerald Buddha. Over the years i have returned many times. Something draws me back. The Palace is the pure essence of Thailand. If you are a tourist then the entry fee is 500 baht. Make sure that you follow the dress code. Basically shoulders and knees must be covered. Do not wear any revealing clothing. Dress respectfully and be polite and well mannered. Great architecture and general aesthetics. Flooded with many other tourists during the peak season so walking out and about can be an issue. Also try to NEVER go during summer season / hot weather. It's awful to walk around in such heat amongst so many other tourists. But an experience worth having nonetheless. Decent attire is absolutely a must. Can't have a lot of skin showing. You can buy/borrow from nearby shops if need be. Cameras prohibited in some but not all areas. Essential place to visit on your trip to Bangkok. Has a lot of history to it, architecture should observed up close as the details on each statue, temple and building were so intricate and unique. Word of warning prepare for it to be extremely crowded and make sure you wear long trousers and no sleeveless tops/dresses etc otherwise you’ll have to buy them. Overall I’d say this place is a remarkable masterpiece. The grand palace is a must see when visiting Bangkok. Everything has been so well kept, all of the temples and structures are in great condition and seem to have been renewed over time. The gardens surrounding the palace are immaculate with some of most amazing bonsai trees I’ve ever seen. Be sure to wear long pants or skirt as this is a condition of entry. Alternatively can purchase these out the front or possibly borrow some once inside the palace grounds near the entrance. I would recommend going very early or later in the day as the heat can be unbearable.